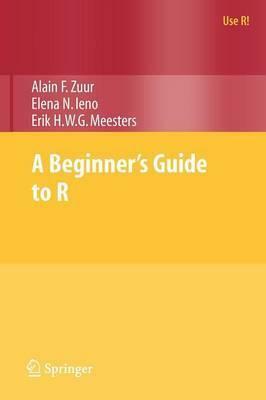 Based on their extensive experience with teaching R and statistics to applied scientists, the authors provide a beginner's guide to R. To avoid the difficulty of teaching R and statistics at the same time, statistical methods are kept to a minimum. The text covers how to download and install R, import and manage data, elementary plotting, an introduction to functions, advanced plotting, and common beginner mistakes. This book contains everything you need to know to get started with R.
Illustrations note XV, 220 p.
Erik H.W.G. Meesters is a researcher at the Dutch Institute for Marine Resources and Ecosystem Studies (IMARES). He specializes in coral reef ecology and applied statistics and conducts research on North Sea benthos and seal ecology. Getting Data into R.- Accessing Variables and Managing Subsets of Data.- Simple Functions.- An Introduction to Basic Plotting Tools.- Loops and Functions.- Graphing Tools.- An Introduction to the Lattice Package.- Common R Mistakes. Alain F. Zuur is senior statistician and director of Highland Statistics Ltd., a statistical consultancy company based in the UK. He has taught statistics to more than 5000 ecologists. He is honorary research fellow in the School of Biological Sciences, Oceanlab, at the University of Aberdeen, UK.Elena N. Ieno is senior marine biologist and co-director at Highland Statistics Ltd. She has been involved in guiding PhD students on the design and analysis of ecological data. She is honorary research fellow in the School of Biological Sciences, Oceanlab, at the University of Aberdeen, UK.